We refuse to live in a world where millions of girls and women are held back. This article was written by Lucinda Hartley. “When one woman wins, another decides to try." These are powerful words from a Samoan Village Women’s representative who has walked the talk. Her journey is one of failure, loss, commitment and, ultimately – change towards ending gender discrimination. Her story is one of many shared at the 11th high-level Commonwealth meeting of Women’s Affairs Ministers in Apia, Samoa last month. Delegations from countries across the Commonwealth met at this triennial meeting to assert gender equality as being critical in achieving the Global Goals. The meeting also reaffirmed that the empowerment of women and girls will make an essential contribution towards achieving the 2030 Agenda. However, ending laws that discriminate against women and girls is an essential first step. Roughly 90% of countries contain at least one law that discriminates on the basis of gender, and Commonwealth countries are no exception. For example, 89% of Commonwealth countries have at least one law that hinders women’s ability to work or to set up and operate a business, and in 20 Commonwealth countries, women cannot do the same jobs as men by law (Women, Business and the Law, World Bank Group). Addressing this, official delegations at the Ministerial Meeting added their support to Global Citizen’s #LeveltheLaw campaign to end discrimination against women and girls. In a landmark event, representatives from Samoa, Fiji, Kenya and the Seychelles pledged their commitment to the #levelthelaw, joining Malta and Australia who have already signed the declaration, and adding their names to the 55,131 existing signatories. Hon. Min. Faimalotoa specifically challenged Pacific delegates to add their commitment to the campaign, noting that “our culture respects our sisters and mothers”. 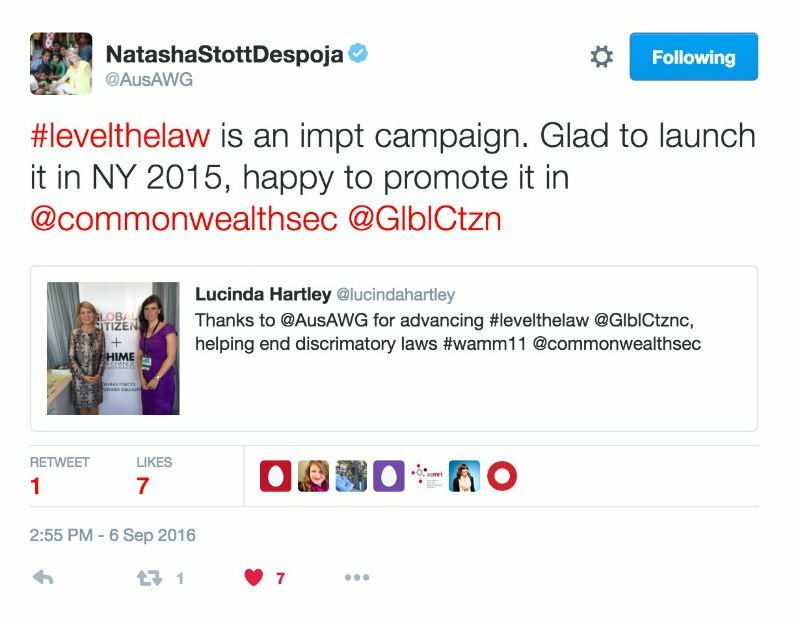 Her challenge echoed a statement made by Her Excellency Natasha Stott Despoja AM, Australian Ambassador for Women and Girls, who commended the work of the #LeveltheLaw campaign in her opening keynote address at the meeting, urging all countries to commit to ending sexist laws. Helena Dalli, Maltese Minister of Social Dialogue, Consumer Affairs and Civil Liberties, also recorded a special video message to highlight the follow up from Malta’s commitment to repeal a law in their Criminal Code that legalized violent abductions of women. A joint statement issued at the conclusion of the meeting confirmed the importance of strong legal frameworks to prevent discrimination against women and girls including the incorporation of international agreements into domestic regulatory frameworks and policies. We refuse to live in a world where millions of girls and women are held back simply because of their gender. Join us and brave campaigners all around the world to #LevelTheLaw.